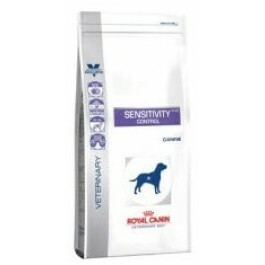 Royal Canin Sensitivity Control is a complete dietetic feed for dogs formulated to reduce ingredient and nutrient intolerances. It includes duck as a protein source and tapioca for a source of carbohydrate. COMPOSITION: tapioca, dehydrated duck meat, hydrolysed poultry proteins, vegetable fibres, animal fats, beet pulp, fish oil, soya oil, psyllium husks and seeds, minerals, fructo-oligo-saccharides, marigold extract (source of lutein). ADDITIVES (per kg): Nutritional additives: Vitamin A: 25000 IU, Vitamin D3: 800 IU, E1 (Iron): 41 mg, E2 (Iodine): 2.8 mg, E4 (Copper): 10 mg, E5 (Manganese): 54 mg, E6 (Zinc): 203 mg, E8 (Selenium): 0.1 mg - Preservatives - Antioxidants. ANALYTICAL CONSTITUENTS: Protein: 21% - Fat content: 9% - Crude ash: 7.2% - Crude fibres: 4.4% - Per kg: EPA/DHA: 3.5 g - Essential fatty acids: 28 g.
Royal Canin Sensitivity Control should be recommended by your veterinary surgeon. For detailed information on feeding amounts and how this food can help your pet, please consult your veterinary surgeon.